PM Brown better explain to the nation why arresting a genocidal war criminal like Livni, Olmert or Barak is a ‘politically motivated’ act. He should also explain to us all why is he convinced that a case against Livni wouldn’t stand a chance in court. As far as Justice Goldstone is concerned, the case against Israel and its leadership is actually watertight. According to the Daily Mail, Colin Powell, the former US secretary of state and a leading player in the Iraq War, has also reportedly expressed alarm about the prospect of arrest in Britain. Yet, no one in Britain politics rushed to appease the American politician or to amend British universal jurisdiction laws just for him. Clearly, Israeli lobby has much more influence within the British cabinet than the USA. This shouldn’t take us by a big surprise considering our Foreign Secretary David Miliband is a listed ‘Israeli Hasbara (Propaganda) Author’. Brown admitted that 'There is already growing reason to believe that some people are not prepared to travel to this country for fear that such a private arrest warrant - motivated purely by political gesture - might be sought against them.’ Surely this is good news. Criminals such as Livni or Barak should never dare to step on a plane. Instead they should stay in their Jewish Ghetto and stare at the separation walls they erected around themselves. The PM said he wanted legislation putting jurisdiction for war crimes and similar offences under the CPS to be brought in 'as soon as possible'. This is indeed what you would expect from a government that is so heavily funded by the Jewish Lobby. Such a move would allow attorneys such as Lord ‘green light’ Goldsmith to open Britain’s gate to Israeli genocidal murderers. Yet Brown failed to tell the Brits what it is that stops magistrates from taking the right decisions regarding war criminals. Let us face it. If Brown doesn’t trust Britain’s magistrates he better let them go. 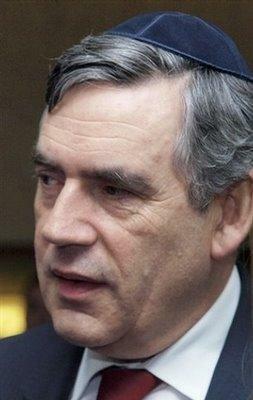 He can always hire some Rabbis to look after Britain legal system. If Britain is about to give up on its universal jurisdiction laws, it better be prepared to let some tribal experts to look after its ethical stand. I do not know much about the ‘eyes’ of the international law’ or ‘world opinion’, but I can assure Brown that his move is more than welcome by the Jewish Chronicle and his Jewish fundraisers. Don’t forget, it is election time after all.